One of the most influential philosophers and theologians in history, St. Thomas Aquinas was the father of modern philosophy of religion, and is infamous for his "proofs" for God's existence. In this cogent introduction to the great Saint's work, Edward Feser argues that you cannot fully understand Aquinas' philosophy without his theology and vice versa. Covering his thoughts on the soul, natural law, metaphysics, and the interaction of faith and reason, this will prove indispensable for students, experts or the general reader. 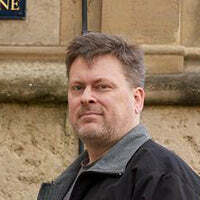 Edward Feser is Associate Professor of Philosophy at Pasadena City College in Pasadena, California. He has been a Visiting Assistant Professor at Loyola Marymount University in Los Angeles and a Visiting Scholar at the Social Philosophy and Policy Center at Bowling Green State University in Bowling Green, Ohio. He holds a Ph.D. in philosophy from the University of California at Santa Barbara, an M.A. in religion from the Claremont Graduate School, and a B.A. in philosophy and religious studies from the California State University at Fullerton. He lives in Los Angeles with his wife and six children.